A friend of my wife, who still rides horses at age 79, recently had a breast biopsy that showed cancer, estrogen receptor positive, nodes negative. She had breast cancer 28 years ago, but no recurrence, so this is almost certainly a second cancer. She was placed on Tamoxifen, appropriate for this condition. A week back, she was told she needed to be seen immediately by her oncologist. I’ve not had cancer, but every time I see a physician, I fear the worst. My vision changed recently, and I started thinking of cataracts and macular degeneration, even though I saw perfectly through a pinhole, a classic manifestation of astigmatism. I’m starting a cataract in my right eye; my maculae are fine, so I have garden variety astigmatism. This woman and my wife were thinking bad scenarios and wondering why nobody told her what was going on a lot sooner. Wouldn’t you worry and wonder why nobody said anything sooner? So, my wife brought a bunch of papers back from the barn, all dealing with genetic markers in the tumor and risk of recurrence. I’m amazed at how far medicine has progressed since I practiced. I’m less impressed by how well medical personnel deal with statistics. The woman was told she needed to start chemotherapy immediately. That’s obviously bad. It is worse, however, because she is absolutely phobic about chemotherapy. Don’t laugh. Any neurologist who has given intrathecal cisternal Amphotericin B to a patient with cocci meningitis knows that when the physician (conditioned stimulus) arrives for the injection, there is a conditioned response of vomiting by the patient. 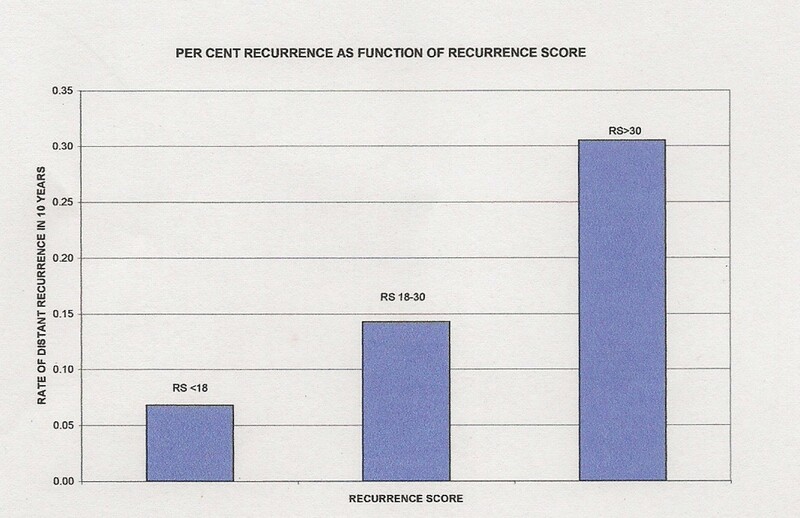 This woman had a recurrence score of 35. That is based on 21 genetic markers, and the score goes from 0 to 100. It is not a ratio scale, so 35 isn’t 7 times worse than 5. If you want the details, go to:http://www.oncotypedx.com/ and look under Healthcare Professionals. After looking at the paper more carefully, two further graphs suddenly put everything into clear focus, even given my astigmatism. 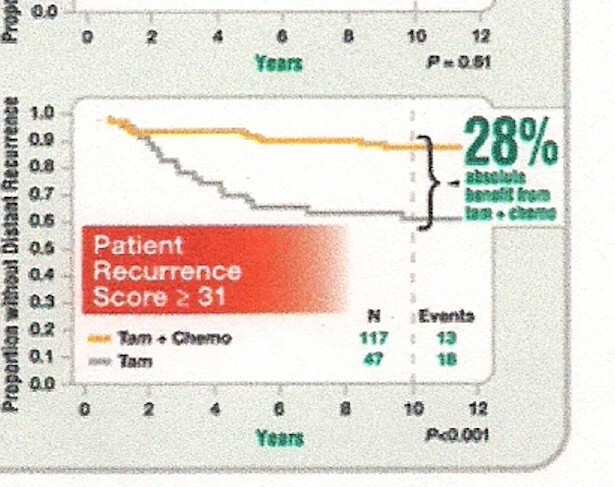 A bar graph showed the absolute percentage of increased risk with and without chemotherapy. 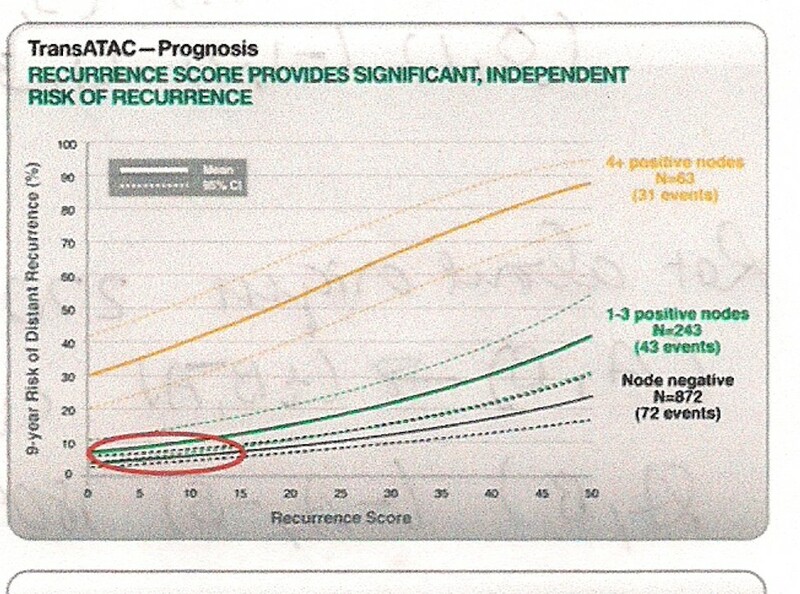 While difficult to read, a RS of 35 means a 15% of distant recurrence (bad), with 95% confidence intervals of (11%, 19%). That means we don’t know her exact risk, but we are highly confident it lies between those values. Note, however, where the y-intercept is: where RS is 0, her risk is 5%. Therefore, I think her increased risk is 10%, not 15%. Note that if she had a RS of 25, she would have a 10% risk. I think the Web page should have commented on this. Finally, go back to the first graph. The curves don’t diverge until at least 2 years, and because the sample size is small for RS >30 (47), I suspect statistical significance wasn’t reached for at least four years. This woman is nearly 80. Summarizing, she has a 15% chance of distant recurrence in 9 years and a life expectancy of 9 years. The increased risk of distant recurrence doesn’t kick in until 3-4 of those years. Her increased absolute risk is under 10%, not 28%. Should she get chemotherapy? That is her decision, not the oncologist’s, the insurance company’s, or mine. But what she needs is a clear statement of the potential risks and benefits. The risks are chemotherapy in an elderly lady who is likely more sensitive to the side effects, including difficulty using her fingers and walking and fatigue, making it impossible to ride her horse for 6-12 months. We are now getting into the “art” of medicine, which is important, but must follow giving the patient the information she needs to make an informed decision. I believe she needed an appointment, but the “come in immediately,” approach was unfortunate (my wife used “appalling”). Testimonials should also be removed from the science portion of company Web pages. Busy physicians need better summaries of data, and if studies are mixed, there needs to be unusually clear writing. Summaries are good, but the information that significance kicked in after 4 years in this lady’s group was important in this instance and found only after a lot of work. A scatter plot of RS and outcome would have been helpful, since grouping data throws away information. What we need is somebody who understands statistics, medicine, and knows how to write clearly. I know an individual who can do that. We should treat patients as unique individuals who are anatomically and physiologically similar and respond in similar ways pathologically. Each of us has emotional, occasionally irrational approaches to life. In medicine, these responses may be detrimental but must be validated. When I practiced, data were my friend. I told patients the risks and benefits of procedures, like carotid surgery. I told them the two ways I could be wrong (recommend a bad thing, not recommend a good thing), tell them what the literature showed, give them my opinion, and then allow them to make what I felt was an informed decision, based on my use of the history, physical, lab, knowledge of the individual and known risks and benefits. It is a shame that in the face of good data, that this woman was put through a death scare. I have long felt medicine needs clinical statisticians who know how to communicate, which is why I took time, effort and money to get my statistics degree in addition to my medical degree. This instance tells me that despite the disinterest I encountered, there is still a need. I worry what may be happening in other instances. Over the years, most of my statistical consulting was for free. This was, too. But never have I felt as useful to a patient as I have here. She was not going to go through chemotherapy and worried it was the wrong decision. I helped her realize that for her, the decision made a great deal of sense. And that’s what informed consent is all about. This entry was posted on December 10, 2009 at 14:29 and is filed under 2011, COLUMNS IN "REALITY CHECK", MY WRITING. You can follow any responses to this entry through the RSS 2.0 feed. You can leave a response, or trackback from your own site.